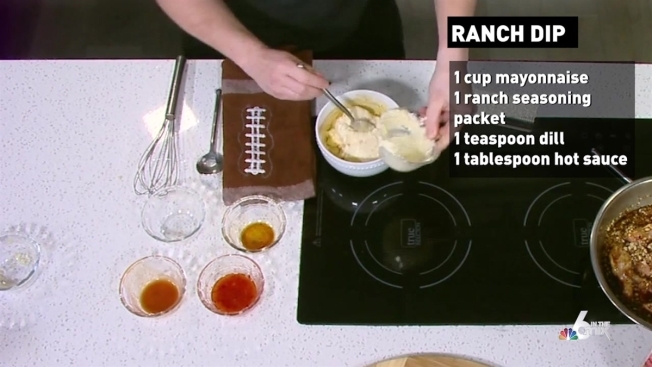 Chef Adrianne Calvo shows off how to make chicken wings for your Super Bowl party. The biggest night in football is upon us and you might be looking for a spot to catch the big game with your best buds. Besides the usual spots like Flanigans and Duffy’s, there are plenty of other places around town that you can get your party on for Super Bowl 2019. The popular South Florida brunch spot will be offering unlimited beer and wings for $30. Or you can just opt for unlimited beer or wings for $20. The promotion starts at 6 p.m. and runs through 10 p.m. The promotion can be found at all South Florida Tap 42 locations. The Spanish-themed restaurant in Coral Gables is offering extended happy hour specials from 5 p.m. through close to celebrate the big game. The big game can be seen on the club’s 30-foot and 16-foot LED screens, plus 52 other TV’s complete with surround sound. The party will feature an open bar from 6 pm to 10 pm, as well as a complimentary BBQ plate featuring chicken, ribs, wings, and all the trimmings. Early-bird tickets for this event are $30 for ladies and $50 for men. Get those tickets early, though. As game day approaches, ticket prices will increase. There are additional specials available at the rooftop, including open bar packages and $11 beer buckets. Doc B’s will offer their happy hour specials from open to close on Super Bowl Sunday. Guests can find something fit for every palate for under $12, including spicy chicken littles, a half rack of ribs, and much more. Doc B’s is also offering 30% off their catering menu for those who want to stay at home. While the popular bowling alley in Doral isn’t offering any specials, they do have new menu items like a spicy Hawaiian and BBQ chicken pizza that could entice you to check them out. They also have giant, shareable (or not shareable if you’re ambitious enough) 32 ounce mugs of beer. Head over to the W Miami in Brickell and check out their 15th floor terrace overlooking the Miami skyline and Biscayne Bay. Check out their specials like $20 buckets of beer and $10 lite bites, which include KFC sliders, Asian wings and much more. The hotel is hosting a viewing party at their UVA Bar, where you can watch the game on a massive 200 inch flat screen TV. The hotel is offering a four for $20 beer bucket promotion, pitchers of draft beer for $12 and two for one well drinks. They also have plenty of snacks available, too! After going for a scenic walk in art-centric Wynwood, check out Wynwood Kitchen & Bar, who is offering an extended happy hour, $5 special bites and much more. Bring all of your friends and watch the game in luxury from 1 Hotel’s rooftop cabanas. The fun starts at 4 p.m. Packages range from $1,500 through $10,000 and include food, beverages and personal large screen TV’s. Head on over to this see and be seen spot on South Beach. Bagatelle will host their famous Sunday brunch with a Super Bowl twist. This playful oceanfront hotel has something for everyone on Super Bowl Sunday. Head to The Backyard and enjoy the game on a blow-up TV, along with food specials and happy hour pricing on drinks from 4 – 10 p.m. But for something a little more luxurious, book a private bungalow, which includes wings, beer, vodka, water, champagne and a personal server. Head over to the South of Fifth and enjoy some Mexican food. The restaurant will offer wings and a pitcher of beer for $26. You can enjoy other game day treats like guacamole and margaritas, and much more. The new sports bar and arcade on Ocean Drive is offering a BOGO deal on Swirlies for people in team gear, $20 buckets of beer, food specials and much more. Enjoy $1 hot wings, $9 premium drinks and other great specials. But show up at 11:30 a.m. and you’ll enjoy flowing mimosas and endless Bloody Mary’s through 4 p.m. Enjoy food and drink specials as you cheer for your favorite team. Half-priced nachos, and $3.50 cans of Corona are just some of the specials you’ll find at this outdoor spot. The South African inspired eatery in Brickell City Centre is set to offer $5 draft beers, half-off wines and discounted shareable bites. The iconic Miami Beach hotel is offering football fans the ultimate poolside game day experience. Those wanting to experience the game from a private cabana can do so starting at $450. The lobby bar and restaurant inside the Intercontinental Hotel in Miami is offering $5 snacks and $5 specials on beers. Specials begin at 5 p.m. and will run through 11 p.m.
Root for your favorite team at Burlock Coast at the Ritz Carlton in Ft. Lauderdale, where they are offering a tailgate package for $53, which includes a half dozen wings, half dozen oysters, a bucket of beers and fish n chips. La Centrale, an Italian food hall at Brickell City Centre, is extending their $5 happy hour menu for its Super Bowl watch party hosted at the second floor’s Aperitivo Bar. Guests can upgrade their watch party experience with unlimited Negroni from their free-flowing Negroni fountain for $20. Lona at the Westin in Ft. Lauderdale is offering a massive projection screen TV, bottomless guacamole for $5 a person, $5 tacos, and Mexican beer tubs at $5 a beer. The popular hotspot on Hollywood Beach will have a tailgate barbeque at 2 p.m. The game will be played on a big screen TV. They will also have limited VIP tables available, like 6-person tiki huts and 4-person tables. Tables start at $175 and tiki huts start at $260 and include food and beverage. Miami Beach's only gay hotel will show the Super Bowl, as well as offer $3 PBR beers and $5 margaritas all night. NBC6 reminds you to enjoy the game responsibly. Don't drink and drive. Be sure to utilize ride sharing services like Uber or Lyft, or appoint a designated driver.